The awardee for 2018 is Philip Christensen, Regents' Professor of Geosciences in Arizona State University's School of Earth and Space Exploration. "I'm very pleased and flattered, and also surprised by the award," Christensen said. "I've worked with a lot of talented planetary scientists over my career and never expected to receive an award like this." 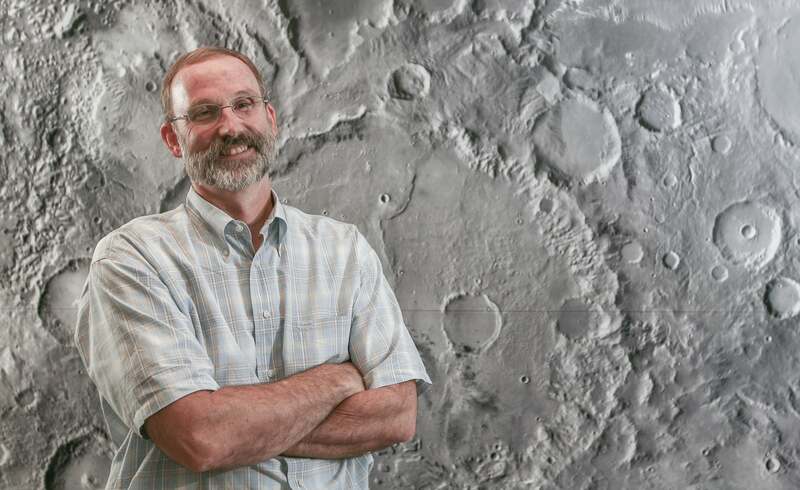 Christensen, who has been at ASU since 1981, has long focused his research on Mars, where his work has explored the nature and conditions of the rocks and sediments on its surface, as well as the dynamics of its atmosphere, which is currently experiencing a global dust storm. But his work also reaches beyond Mars to include building instruments for missions that are heading for the near-Earth asteroid Bennu, Jupiter's moon Europa, and the Trojan asteroids associated with Jupiter. The common thread running through these explorations is infrared, or heat, radiation. But long ago, this focus nearly caused him to fail his PhD exam. "I was all about temperature," he explained. "Then I realized that if you have a surface that combines fine-grain sand and sediments with rocks, it no longer behaves in a simple way." During his exam, one of his questioners was a scientist who dealt with stars, which are self-luminous objects. "This astronomer grilled me for 20 minutes on the physics," Christensen said. "Finally, we both realized the confusion — with stars, we observe radiation from a hot dense gas. But with planetary surfaces, the radiation is coming from rocks and other materials on the ground that emit and reflect radiation very differently." This meant that infrared radiation from a planet's surface follows different physical laws than is true for stars. "It led me to realize that my original interest in using infrared for temperature measurements could also be used to get composition information," he said. "And the two approaches rolled together gave a much better picture of the Martian surface than either approach did by itself." The insight is not original with Christensen. But he has used the principles to determine the nature and properties of surface materials all over Mars and is now taking the techniques out into the solar system. Any advice for up-and-coming students? "I teach both undergraduates and grad students, and I often hear them say that they feel they've missed a golden era of planetary exploration," Christensen said. "I say that there are many, many discoveries yet to be made, even at Mars where what we've been doing so far is mainly clearing ground for what's to come. "I always tell them the next 30 years will contain as many wonderful discoveries as the last 30 years."